PASADENA, Calif. (NASA PR) — NASA’s Voyager 1 took a classic portrait of Earth from several billion miles away in 1990. 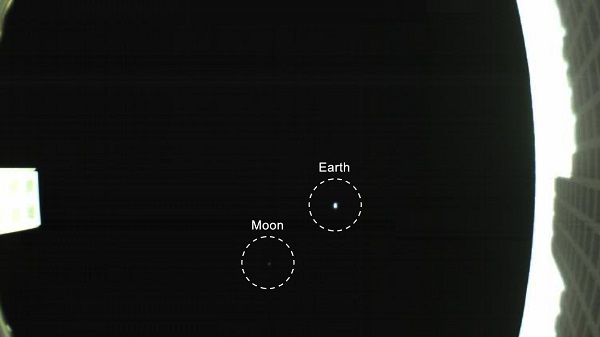 Now a class of tiny, boxy spacecraft, known as CubeSats, have just taken their own version of a “pale blue dot” image, capturing Earth and its moon in one shot. The MarCO CubeSats were launched on May 5 along with NASA’s InSight lander, a spacecraft that will touch down on Mars and study the planet’s deep interior for the first time. InSight, short for Interior Exploration using Seismic Investigations, Geodesy and Heat Transport, will attempt to land on Mars on Nov. 26. JPL also leads the InSight mission. Mars landings are notoriously challenging due to the Red Planet’s thin atmosphere. The MarCO CubeSats will follow along behind InSight during its cruise to Mars. Should they make it all the way to Mars, they will radio back data about InSight while it enters the atmosphere and descends to the planet’s surface. The high-gain antennas are key to that effort; the MarCO team have early confirmation that the antennas have successfully deployed, but will continue to test them in the weeks ahead. InSight won’t rely on the MarCO mission for data relay. That job will fall to NASA’s Mars Reconnaissance Orbiter. But the MarCOs could be a pathfinder so that future missions can “bring their own relay” to Mars. They could also demonstrate a number of experimental technologies, including their antennas, radios and propulsion systems, which will allow CubeSats to collect science in the future. We shall see if these cubesats can get to Mars without getting fry by GCR.